If you are trying to purchase a crossbody cell phone bag, a mini crossbody wallet purse, a mini crossbody purse for cell phone, a wallet with a phone case for women or even a small travel wallet purse that can hold your passport or iphone or samsung look no further than CHALA HANDBAGS as they have become the Premier Brand for Casual Handbags, Cellphone Purses, Crossbody Bags, Mini Crossbody Bags and Totes for Women. Casual, zany, whymsical a favorite for all ages and the woman on the go this is the perfect Purse Phone Bag because is convertible from a Mini Crossbody Cell Phone and Passport Purse to an over the shoulder style or even into a wristlet to hold your phone, keys, passport and lipstick by using the convertible strap system. Fits IPhone6- IPhone 6 Plus, Iphone 7 , Iphone 7 Plus, Samsung Galaxy S4 Samsung Galaxy S5 and all other modern Cellphones and Smartphones. 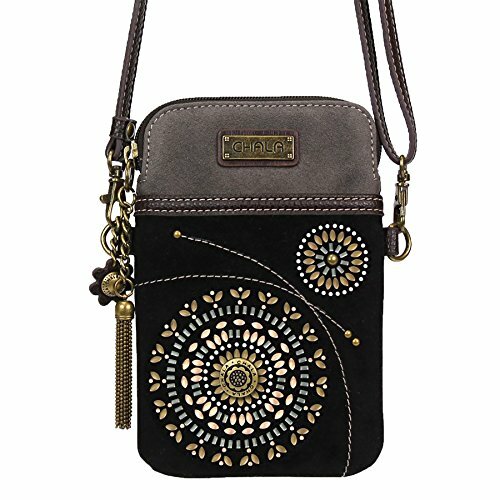 Super cute & casual, this purse converts to 3 styles- Clutch, Purse & Crossbody. Adjustable Strap - turn the bag into a purse, a crossbody bag, or even a purse wallet phone case! Top zipper closure. Patterned fabric inside lining. Extra padding throughout the bag to protect your cellphone. Materials used: Faux leather. Approx. Measurements: 5" x 1" x 7" Strap adjustable: 7"~28" Designed in California, USA, . Colors might not be exactly as pictured. Lining patterns may vary. If you have any questions about this product by CHALA, contact us by completing and submitting the form below. If you are looking for a specif part number, please include it with your message.